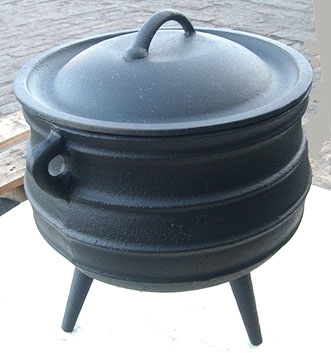 1318 Warrior Pot Height: 4.5" * Width: 6.75" * Capacity: 28 oz * Weight: 4 lbs. Size 33 Gallon Giant Kettle Height: 25" Width: 27" Capacity: 33 Gallon Weight: 176 lbs Requires Truck Shipping Contact us for shipping quote. Size 55 Gallon Giant Kettle Height: 28" Width: 31" Capacity: 45 Gallon Weight: 300 lbs Requires Truck Shipping Contact us for shipping quote. Size 85 Gallon Giant Kettle Height: 31" Width" 35" Capacity: 85 Gallon Weight: 505 lbs Requires Truck Shipping Contact us for shipping quote.